Fungi grow with tubular cells extending by kilometers. Growth takes place exclusively at the tip. Researchers of Karlsruhe Institute of Technology (KIT) have now found out how this works: Construction materials are transported on rails through the fungal cells and used at their outermost tip. Calcium concentration at the end of the cell defines when this happens. This is reported by the scientists in the Proceedings of the National Academy of Sciences (PNAS). Although omnipresent, fungi are considered most mysterious organisms by human beings. Until the late 20th century, chanterelles and horns of plenty were considered plants due to their sedentary lifestyle. Today, it is known that fungi form an empire of their own, which is much closer to that of animals. Experts assume that there are up to five million fungal species, many more than plants or insects. Most of the fungi are hyphae. Their filamentary cells form fine, very large networks in the ground. These mycelia form the fungus proper, while the hats commonly referred to as fungus only represent the fruiting bodies. Professor Reinhard Fischer of the Institute for Applied Biosciences (IAB), Professor Gerd Ulrich Nienhaus of the Institute of Applied Physics (APH), and Professor Norio Takeshita, who just accepted a professorship at Tsukuba University in Japan, and their teams studied how the hyphae grow by infinite extension of their microscopically small tips and form partly gigantic mycelia. Contrary to "conventional" growth by cell division, hyphae grow nearly infinitely (similar to human nerve cells) by extension at their tips. As a result, hyphae may reach a length of several kilometers. While they appear rather modest, hyphae are world champions in growth. "Having a diameter of three micrometers, hyphae can grow by more than one micrometer per minute," Reinhard Fischer says. "This would correspond to human beings gaining ten centimeters in thickness every minute." No wonder that the biggest living organism on earth is a fungus: A honey fungus in the forests of Canada was found to have a diameter of 17 km. For other organisms, this enormous growth is both a blessing and a curse. "Apart from bacteria, fungi are the best recyclers of organic waste. Its constituents can then be used by the next generations of organisms," Fischer explains. 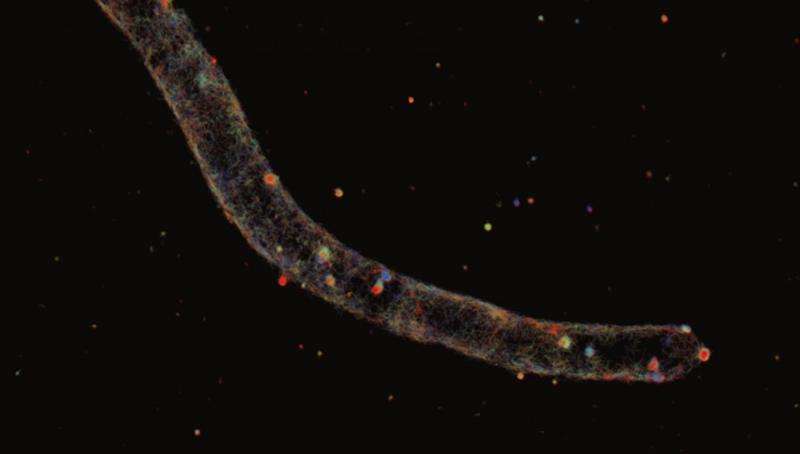 Moreover, fungi play an important role in nutrient uptake of plants: "For every meter of a plant root, there is one kilometer of symbiotic fungal hyphae that supply the plant with nutrients," the microbiologist adds. Fungi also help produce medicine (penicillin, citric acid) and food (cheese, salami). On the other hand, hyphae are dreaded pests of crops and pathogens. Hence, understanding of the growth processes of hyphae is of interest to both scientists who want to study their positive properties as well as to scientists who want to fight their negative properties. How these growth processes work is studied by international teams of researchers. So far, however, exact coordination of the growth processes has been unknown. It was known that mycelia do not extend continuously, but grow in phases. It was not known how these growth explosions are initiated and controlled. "As hyphae extend at the tip only, the question was: How do they know where the tip is? ", Fischer says. The KIT researchers found that the tip is tagged by certain proteins. The construction material required is supplied in vesicles, small bubbles on motor proteins running on long rails. Upon their arrival at the tip, the vesicles attach to the cell wall and merge with it. As a result, the cell extends. The growth phases are controlled by the calcium concentration at the end of the hyphae. "If the concentration is small, the transport phase starts. In case of a calcium pulse, the vesicles merge with the cell membrane and release their content." The cell wall consists of chitin, the material of which insect carapaces are made. The team visualized the growth processes by marking key elements of the cell's signal and transport system with fluorescent proteins, Norio Takeshita says. For quantitative imaging of living fungi, latest highest-resolution optical fluorescence microscopy methods were applied in this interdisciplinary project. The scientists expect that their findings will be used for the development of fungicides in agriculture and in the clinical sector as well as for the optimization of biotechnological processes in medicine production.